I guess you know by now I really like playing with charts (and numbers)... what about some statistics about what's happening in APEX world? Once the new APEXBlogs goes into production I plan to add statistics about number of visitors and which countries are accessing the site the most. If you can think of other statistics you want me to include, feel free to add a comment to this blog post. 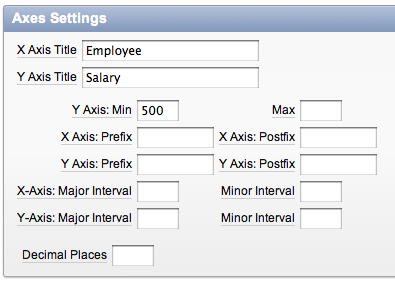 A new feature in APEX 4.0 is that you can define per series what you want the series type (Bar, Line or Marker). Lets start with an example. We create a 3D Column chart based on the salary of the employees. As you can see that is not really what happened. 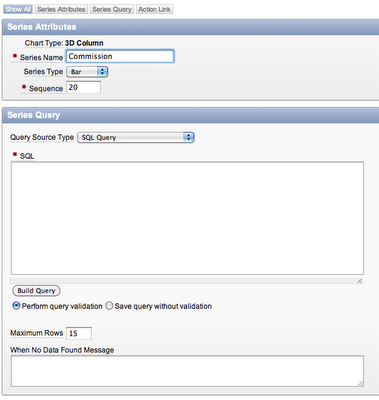 It seems there is a bug in APEX 4.0.2.00.07 (and probably before) with defining multiple series in the same query. 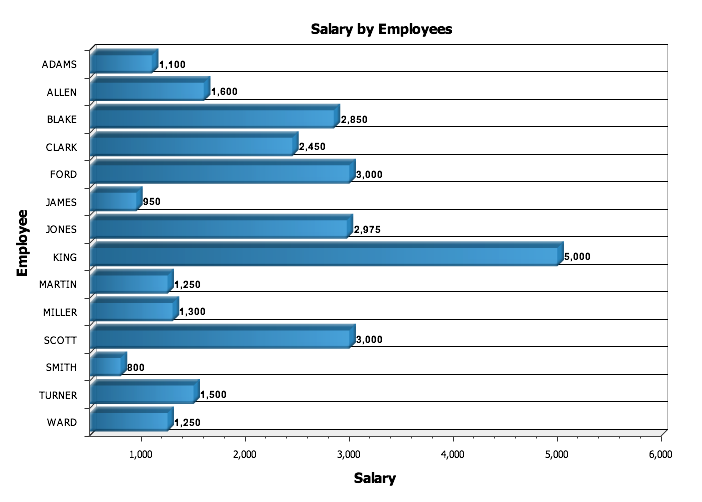 What happened is that the first value, salary, is still a bar, but the second value, commission, changed from bar to line and the third value, average salary, became a bar (that is because our main chart type is a 3D Column chart, so it takes whatever is default). So APEX doesn't take the Series type into account correctly. 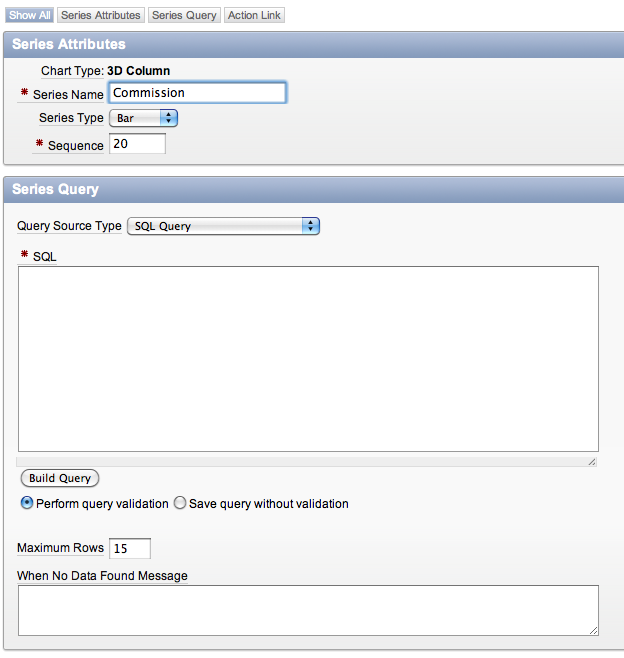 The workarounds is to not use the single query with multiple values, but a single query per series. Let's pretend you still have that 3D Column chart of my previous post or create a new chart. 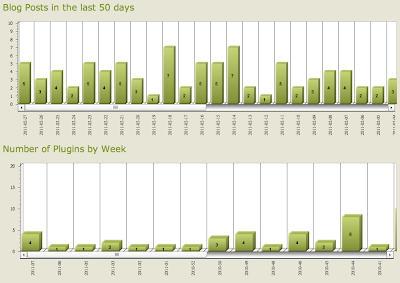 Now edit the chart and go to Chart Attributes and look for the Chart Series section. Hmm... the value option is not here... yes, that is a bug... if you go further with the wizard you will end up with "select * from emp" instead of a real query for the chart. 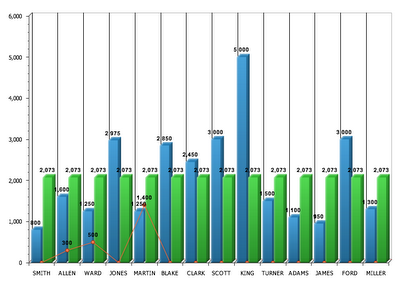 The strange thing though is that during the creation of the chart it works just fine. Also when you edit an existing series and hit the Build Query button it works ok as you can see on the next screenshot. My guess is there's something wrong with session state. The workaround is to edit an existing series, follow the wizard there, copy the sql statement, cancel the edit, and then add a new series and paste the sql statement. 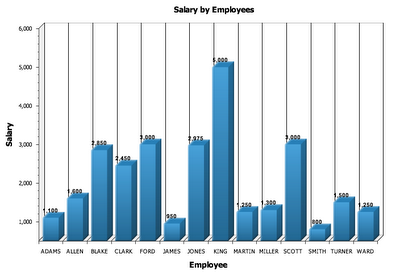 Or if you are more experienced and know the syntax of the chart you can just manually enter the sql statement. 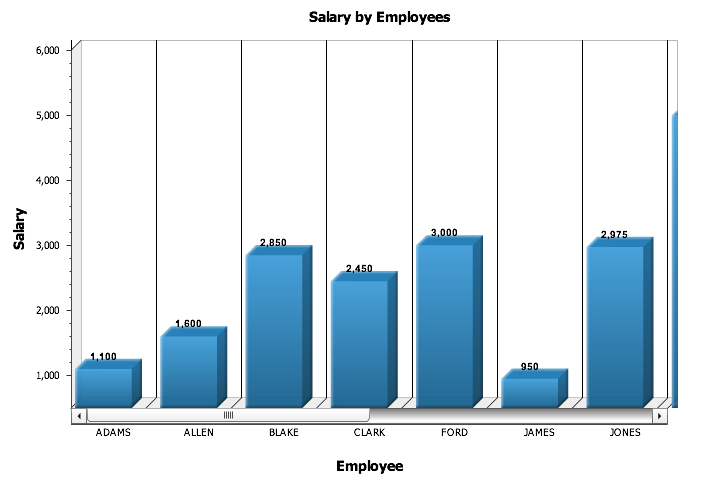 For a chart you can define the fonts and colors you want to use for the different components (mostly text) on the chart. This works great except for the Grid Label. It seems that that value never gets stored when you change it. I thought if I wanted to change the grid lines of the chart I could change the Grid Label settings. 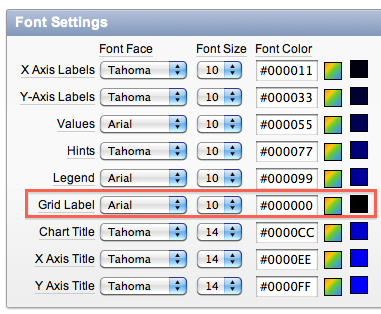 I'm not sure why Label is specified after Grid and not Line, as I'm not aware of labels against the grid. It seems that currently there is a hardcoded value of "Black" against the line color of the X axis grid and nothing for the Y axis grid (so default of AnyChart). Again the workaround is simple if you want to have a different line colors of the grid (X / Y Axis), you can just change it in the XML after you specified Custom XML = Yes. 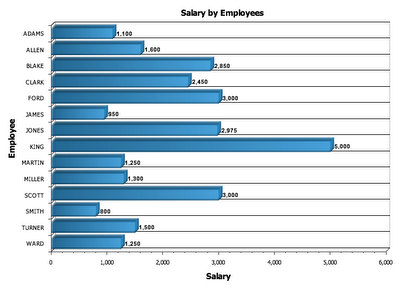 Consider this chart, it just shows the salary of the employees in a 3D Bar chart. Now, if you want your chart to start with e.g. 500 instead of 0 you need to define the axis minimum value. 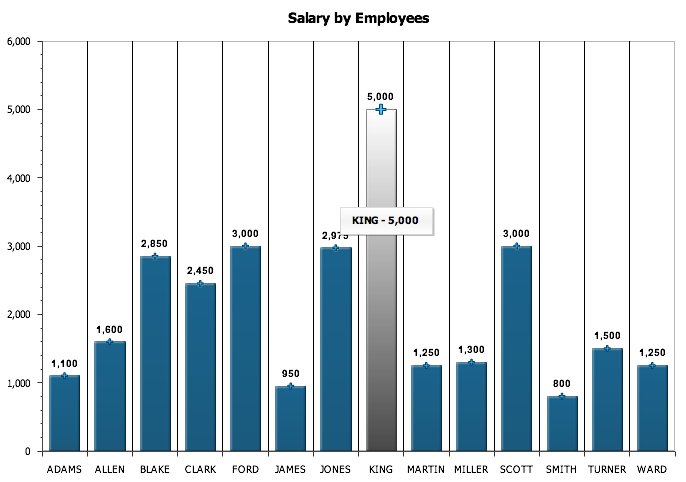 The wizard shows X Axis: Min, so lets put 500 as the value in... However running the chart again gives the same result. This is in fact a known bug in APEX 4 (bug id 11700598), or you can read on it in this forum thread. 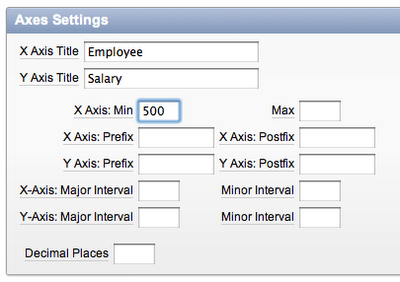 Basically the Axes Settings should show the Y Axis Min instead of the X Axis. The workaround is to change your chart type to 3D Column (instead of 3D Bar Chart). 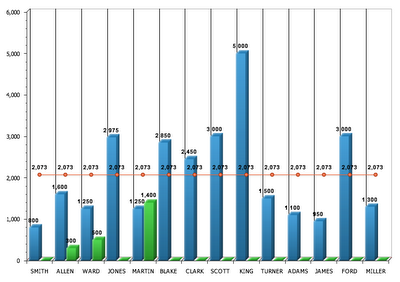 Running the page gives us this result, so yes it's different, but for this chart the wizard is correct. Later you can change the chart type again and it should be ok.
Run the page again and the chart will start from 500 instead of 0. 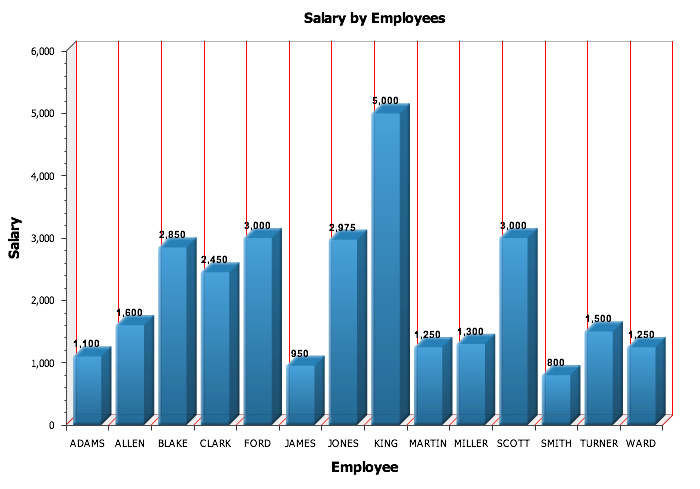 So now you can change the type back to 3D Bar Chart and you see it applied the start value correctly (the axis start now from 500). 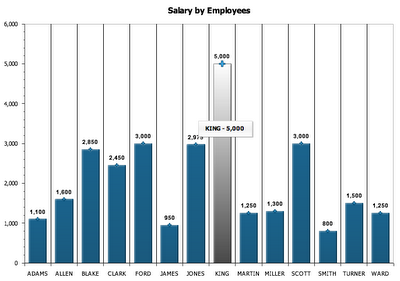 Let's say we kept the 3D Column chart type but added a scrollbar for the X-Axis. Running the page shows us this! 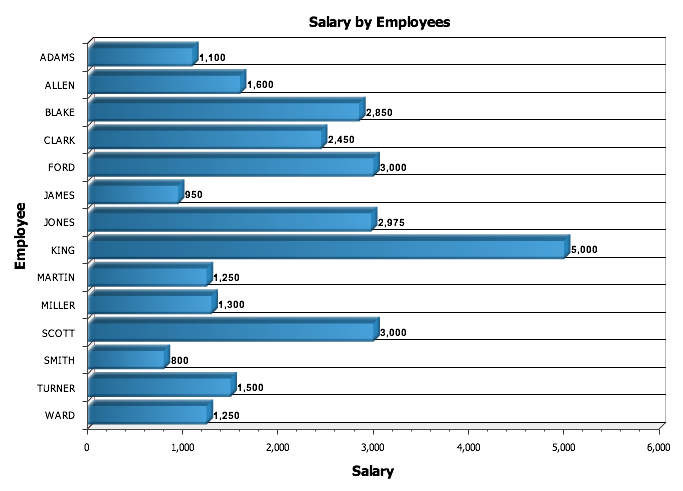 The chart is only partially visible. This is related to the previous bug... as we defined a value of the X-Axis Min when the chart type was still 3D Bar Chart, APEX still keeps that into account... (that is why the workaround worked before). However in this case it has a negative impact on the way the chart is shown. 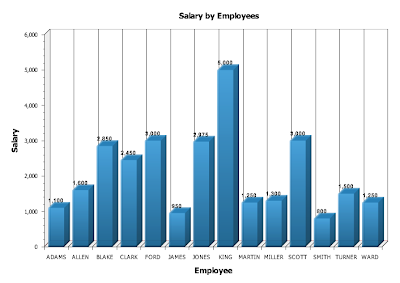 The way to correct the issue is, change the Chart Type back to 3D Bar Chart, delete the value that is in X-Axis Min, hit the Apply Changes button, edit the chart again and change the Chart Type back to 3D Column. 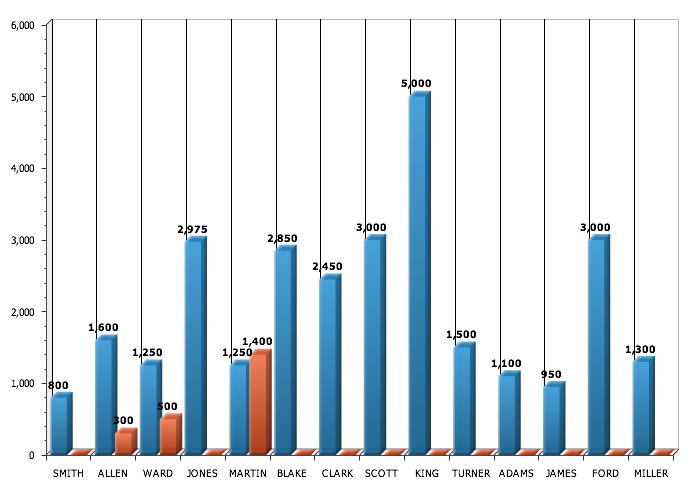 Running the page again shows the correct chart. Something surprised me in APEX 4.0.2.00.07 (and probably entire 4.0). A value of 0 degrees results in a horizontal gradient with the first background color on the left and the second background color on the right. Cool isn't it? ... But I just wanted it a little bit different, I wanted the first color (green) on top and the second color (yellow) at the bottom. So I would have thought if I change the value of the Gradient Angle to 90 that will do it... but no, the same (or very very similar). If you want the same as me and really use the Gradient Angle you either have to multiply your value by 60 or change the XML yourselves (Custom XML = Yes and you can change it). I prefer the second option as if they fix it (as I can't believe it was intentional!) you end up with a different gradient angle. 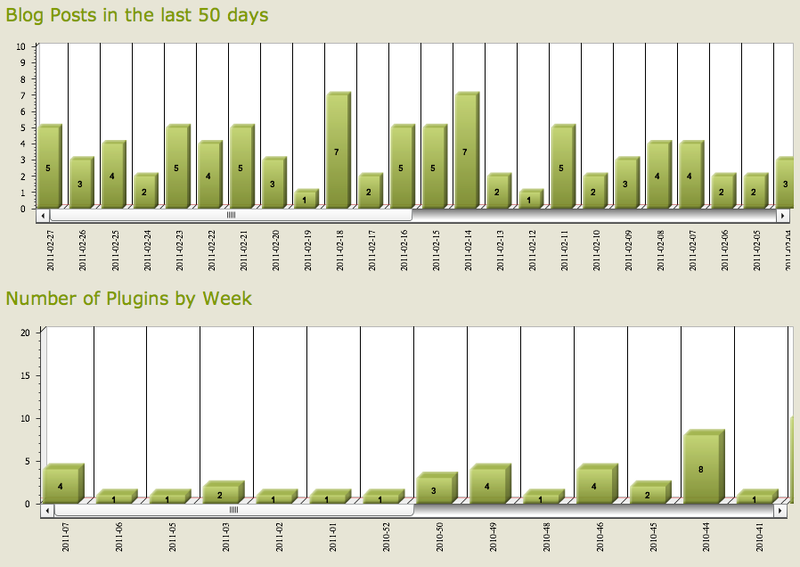 It seems to me that in APEX 4.0.2.00.07 (and probably entire 4.0, but can't check at the moment) there's a bug with adding markers to your (bar/column) chart. For a Pie chart it works fine. 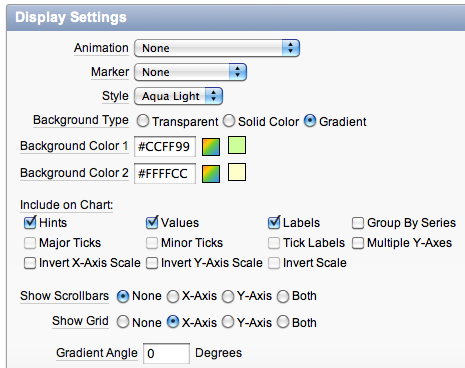 If you edit your Chart Attributes you can define a Marker in the Display Settings. 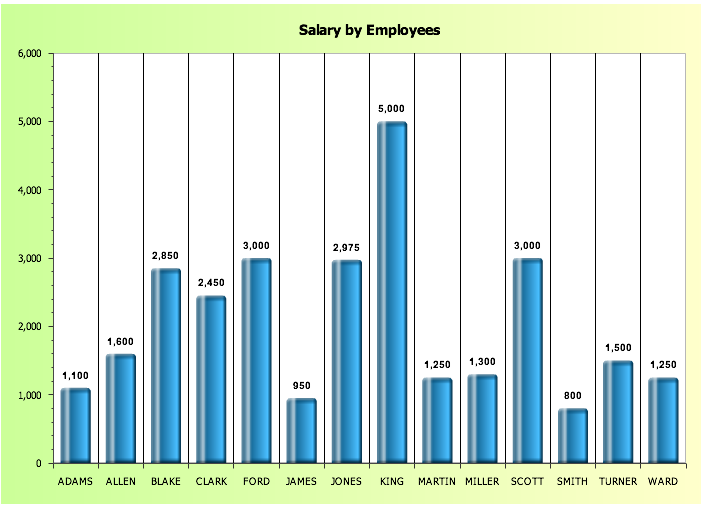 However when you run the page and look at the chart there is no Marker to see. - customise the XML (my preferred option): you set Custom XML in the Chart Attributes to Yes and you change the marker section to the marker you want. You will see marker type="None", but you can easily change that. 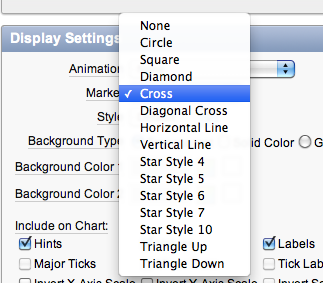 Below I changed it to Cross, to have a cross marker. 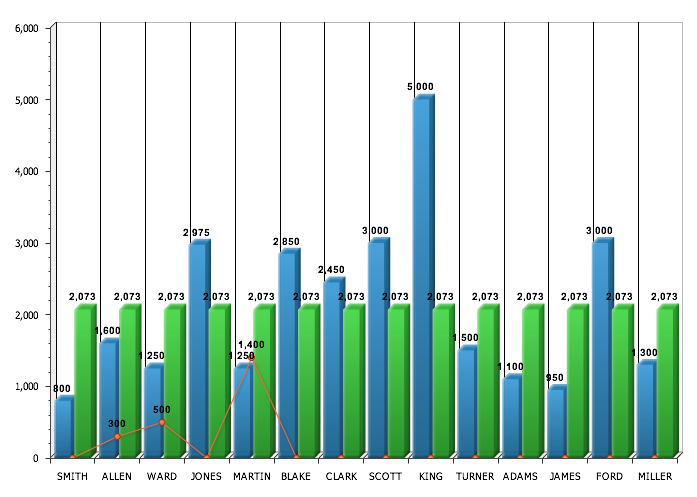 - add another Series in the chart of type Marker, but this is not my preferred option because you lose performance as it will need to run the query twice. I'm sure the APEX development team will fix it soon, but for now you know a workaround. 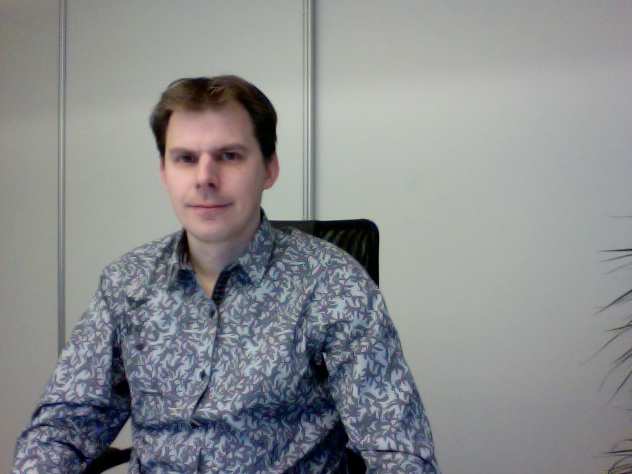 The OBUG Benelux Connect 2011 conference is almost there. If you want to go to the biggest Oracle conference in the Benelux, you have to be present on March 29 at SQUARE in Brussels, Belgium! This year it's even better than last year, with top speakers such as Chris Leone, Tom Kyte, Wim Coekaerts, Andrew Sutherland and Peter Gates. There are over 42 different (mostly customer) presentations, User Experience Customer Feedback sessions, an enormous vendor showcase and a large Oracle demo ground. Also for Oracle Application Express (APEX) there is again a complete track. The APEX sessions are not pure technical, but more case studies. 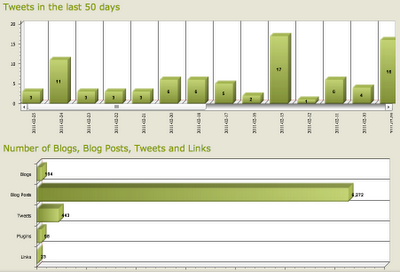 It's a great way to see what others have done with APEX! I'll also do a presentation and this time it will be special for me, as it will be the first time I'll publicly show a product we developed "AE GPS Tracker/Intelligence", which is currently beta-tested by some pre-selected customers. 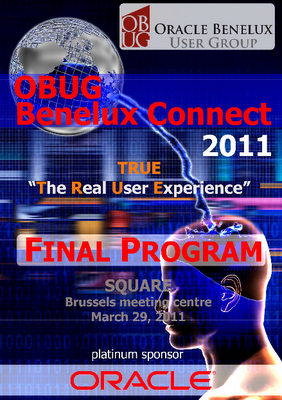 So I would say, OBUG Benelux 2011 is definitely not to miss! People like Tom Kyte and Wim Coekaerts (a Belgian) are not that much in the Benelux! 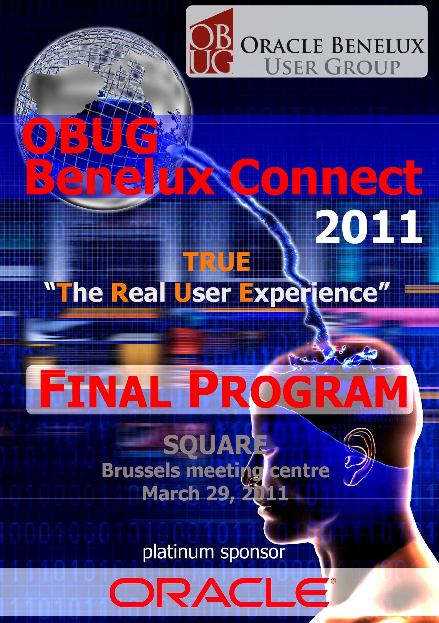 You find the complete program in the Program magazine OBUG Benelux Connect 2011. 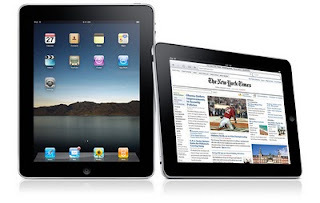 I really like surfing on my iPad whenever I'm not behind my laptop. As the iPad doesn't have a big resolution, Apple made it so that it scales websites to fit on the device. Most of the time it's doing a really good job, but a lot depend on how the developer created the site. If you look at APEX applications, if you are using a standard theme, you have a big chance it renders well and you don't have to do that much. However if you find that something doesn't look good, the way I make my application 'iPad compatible' is by using a different css depending the browser and device that hits the app. Below you see a screenshot of the Header in the Template of the new APEXBlogs site. My starting theme for APEXBlogs v2 was theme 22, but I customised it heavily as you'll see in a couple of days. I'm doing that by overwriting the standard css by defining my own in the apexblogs.css file (so make sure your own css is defined after the standard APEX ones). If the max width of the device is 1024px (like the iPad) I overwrite my own css with specific settings for these devices. So in your link you define for the media "only screen and (max-device-width: 1024px)". As you can see theme 22 of APEX 4 itself actually renders different css's based on the browser (see if IE in screenshot). I chose to not worry about IE6 compatibility, that is why that div "outdated-browser" is in. After Tobias's message I felt I had to do another post and give you some feedback what is going on. 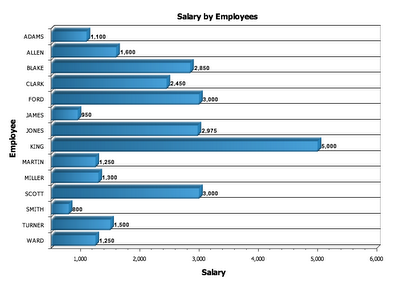 I'm still passionate about Oracle and APEX and work every day (and night) with this technology. That is also the biggest reason I was so quiet the last weeks. I've been very busy with so many exciting things! 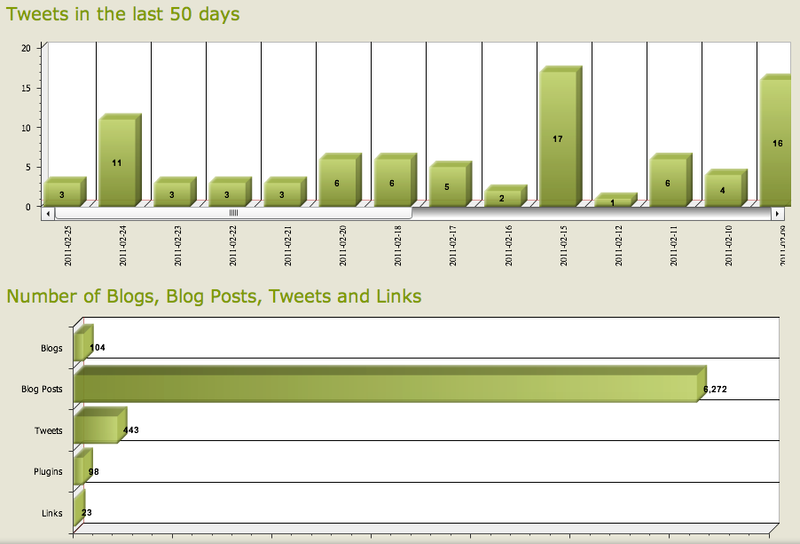 But I'll do some more blog posts about these in the next days and weeks as many are useful for the APEX community too. I'm not sure you already knew but APEX Evangelists is back on the map. Sumneva didn't work out as expected and got dissolved in the form it was, in November last year (as a joint venture of APEX Evangelists and Sumner Technologies). So both John Scott and myself went back to our original name of APEX Evangelists. Scott Spendolini and Doug Gault decided to keep the name Sumneva as a new business venture in North America.